MSA Peruvian Accoyo Santino is a multiple blue ribbon winning robust white male with unbelievable coverage and density coupled with phenomenal finess, crimp and character. Plus Santino's temperment is fantastic! Santino is a full blooded accoyo male who is said to be the best of Accoyo Dracula's offsprings. He has it all from his big strong bones to his correct confirmation and very typey head. Even his crias seem to be very personable. 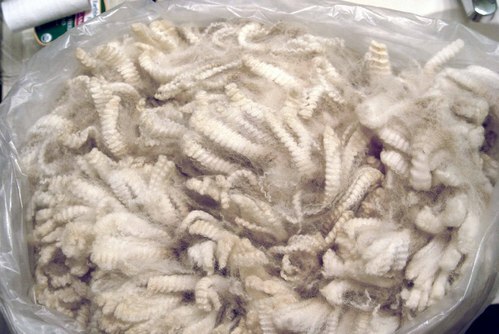 We get more and more thrilled each time we see a new Santino Cria hit the ground. Watch for them at the shows. He is passing on awesome bone density, phenominal fiber and coverage, typey-typey heads and a disposition to die for. In April Santino will be moving to Nebraska to our new farm and it will be the first time that he has been east of the Rockies. Book your breeding for the spring of 2008. This is a sire who is adding great offspring's to our breeding program and will to yours too. Sells with ALL his ribbons and banner! 7/8ths Accoyo, Full Peruvian, Reserve Champion in White. 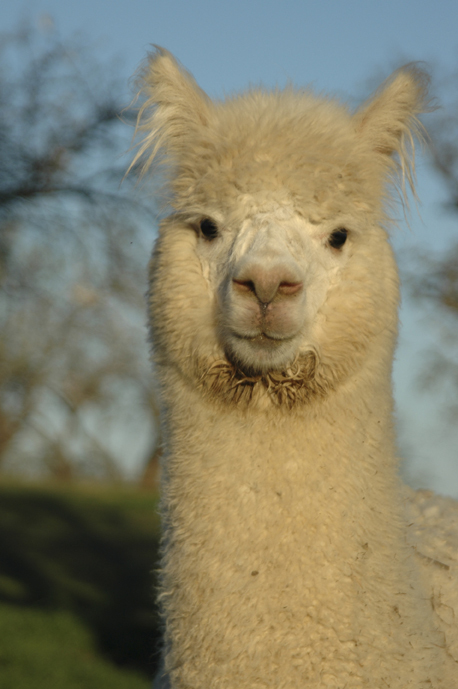 Nicki has a dense, brilliant white fleece that lays in heavy locks... 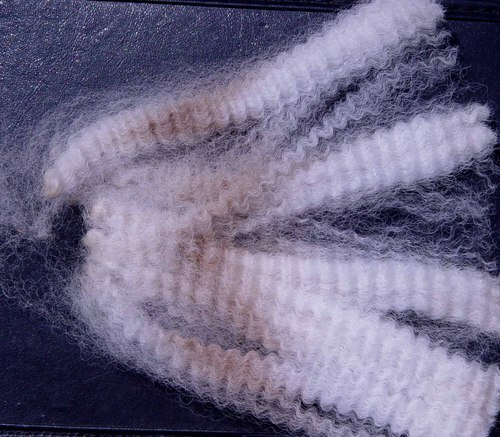 He won Best Brightness in his juvenile fleece at 2007 Monterey Pronk. 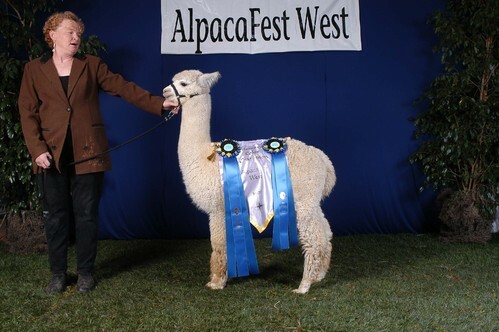 He was 1st in Halter, 1st in Bred & Owned Yearling and Reserve Color Champion in White at 2007 AlpacaFest West. Accoyos Starr Kahn (Shere Kahn son), Accoyo Pinachi (deceased) and Accoyo Dracula/Santino form the backbone of his 7/8th Accoyo pedigree. WOW. His fleece is bright white and displays a heavy deep bold crimp in distinct bundles. His total shear weight at 18 months was 11.1 lbs and his SKIRTED blanket weight was 4lbs 5 oz. Again.. WOW. So we all know that when making breeding decisions we want to focus on just a couple of traits. If you are looking for a herdsire to improve density and staple type on your females, this could very well be the herdsire you want. For the price of a couple of breedings you could own him. Check out his fleece shots. Long staple, distinct bundles, deep crimp all on a correct frame with excellent bone and correct jaw alignment.